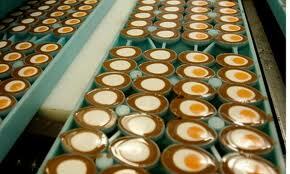 Suicidal Eggs: Clever Advertising Campaign Or In Poor Taste? I know this is a little bit random but further to my recent post bemoaning the quality of American chocolate a close friend, in an effort to cruelly taunt my lack of regular access to decent English chocolate, emailed me a video compliation of all the adverts that Cadbury’s have ever made in conjunction with their delicious little Crème Eggs ‘Release The Goo‘ and ‘Here Today, Goo Tomorrow‘ advertising campaigns. Cadbury’s Eggs are delicious: a thick milk chocolate shell containing a white and yellow fondant, designed to mimic the albumen and yolk of real eggs, covered in a thin foil wrapper. As a child these things were amazingly appealing to me, and were always consumed in the messiest, most time-consuming way possible, but as an adult I now feel that the fondan t strays a little too far into sickly sweet and just thinking about one makes my teeth ache, but they are an undeniably wonderful English classic. I know we whinge that over the years chocolates have got smaller while the prices have increased, but that’s by-the-by and a sorry fact of life for most of the sweets and chocolates that we’ve loved since childhood, however the shrinking size and escalating cost hasn’t held us back. Even though Cadbury’s made the controversial decision to stop selling their eggs all year round and only now target the Easter period and sell to retailers between January and Easter, we go mad when the little beauties appear back on our shop shelves en masse. Over the years Cadbury’s have launched a range of advertising campaigns, secure in the knowledge that their Crème Eggs are a British favourite and therefore confident enough to have a bit of fun with t heir adverts. In 1985 they launched the ‘How Do You Eat Yours?‘ campaign, to celebrate the eccentric ways that the British tuck into their chocolate eggs (as it turns out, 53% of people bite off the top, lick out the cream then eat the chocolate, 20% bite straight through and 16% use their finger to scoop out the cream leaving the unspecified 11% to eat theirs in unspeakable ways that violate the laws of man and nature), and relaunched the same campaign over the 2004-2007 period. 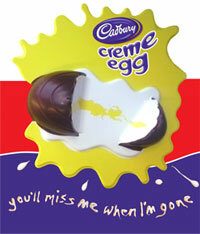 In 2008 they launched their ‘Here Today, Goo Tomorrow‘ campaign, which played with the theme of Cadbury’s chocolate eggs in a variety of situations peeling off their own foil wrapper and putting themselves into dangerous situations, with the main aim to be allowing their delicious insides to escape. 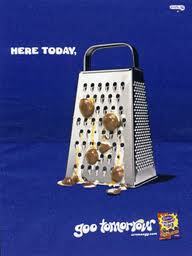 Adverts included: an egg setting off a domino-affect of books, rushing to be squashed under the last book; an egg tipping over and jumping under a meat tenderizer; an egg turning on a hairdryer and standing in front of it until it melted; a fairly dark advert where a room full of eggs each stand in front of their own mousetrap watching an egg high above them whom they mimic, synchronising what seemed to be a mass egg suicide and one where an egg rides a piece of wood into a circular saw. It seemed to follow the format of Andy Riley’s incredibly popular ‘Bunny Suicides’ cartoon books released from 2003 onwards, in which his doom-laden bunnies find increasingly imaginative ways of bringing about their own demise. 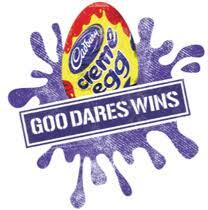 This campaign was incredibly successful, so Cadbury’s followed it up in 2009 with their ‘Release The Goo‘ campaign, which re-released a lot of the original ‘Here Today, Goo Tomorrow’ adverts under the new slogan, as well as a number of new and slightly more violent adverts including an egg pole-vaulting into a food processor and more. This seemed to set the precendent for all subsequent advertising campaigns including ‘You’ll Miss Me When I’m Gone‘ in 2010, ‘Goo Dares Wins‘ in 2011 and ‘Gooing For Gold‘ in 2012 that follows a British Olympic theme where eggs follow the previous self-destructive format however now incorporating Olympic events so that the ‘Eggtheletes’ get messily involved in Hurdles, Diving, Hammer, Javelin and Velodrome, all trying to release their inner goo in the messiest possible way. My problem is that I just can’t decide if the whole thing leaves an odd taste in my mouth or not. I love cartoons and in the animated world countless characters kill each other in awful ways and laughingly return for more day after day, and yet I don’t feel the need to take the moral high ground with them. However, with the Cadbury’s Eggs while it all seems to be fairly fun and frivolous, taking the angle of demented chocolate treats being insanely focused on spilling their innards, I find the adverts just a little bit unsettling. 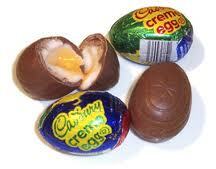 I know that Cadbury’s claim that their Crème Eggs have one goal in life, which is “To let their goo out,” however it’s becoming a collection of suicide ideas and not a motivation to eat an egg. I don’t see any part of the adverts that promote the quality of Cadbury’s chocolate, the wonderful taste of the Crème Eggs or any reason why a consumer should buy. The fact is that chocolate doesn’t need promotion as it’s been instilled into us from a young age that its either a reward for good behaviour, an emotional comfort in tough times or a naughty indulgence. We would still buy it even if we didn’t see an advert on TV, and interestingly enough despite the recent global economic downturn, sales figur es for chocolate has actually gone up because although people are saving money by denying themselves the bigger, more expensive pleasures they still turn to the humble refuge of chocolate for a comparatively cheaper and more affordable dose of happiness. I feel that this rut that the Cadbury’s Crème Egg Advertising Division have fallen into for almost 4-years now has gone on for far too long, and needs to move on to newer, fresher fields. It doesn’t necessarily offend me, although I understand why some would find it a little too flippant in its sidestepping around a potentially serious issue, but personally it just feels a little bit tasteless. Geeky British chick living in Good Old Boy territory in Florida. Gamer, closet ninja, crème brûlée aficionado & on a mission to share the funnies.